Astrologyvidya.com website is dedicated to astrology learners. This site provides all the information free of cost. This site contains astrology tutorials. This site can be used to learn astrology from scratch. An attempt is being made to teach astrology with examples. If you find something non-understandable, you are free to write an email. You can also ask question for absolutely free. You can write email at astrologyvidya@gmail.com In the very beginning we will try to explain the chart/kundli, which you must have seen in your kundli made by pundit ji or made by computer software. 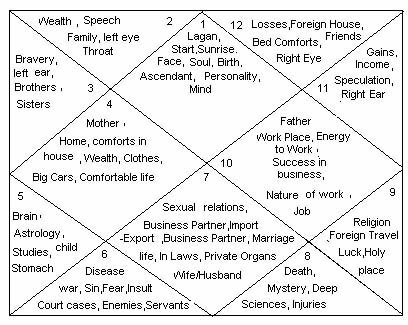 The chart depicts the 12 houses, and the meaning of each house. I will suggest that before proceeding further, you should understand the relevance of each house. for example number one house represents the person himself, his personality, his character, how strong, how weak the person is. It represents the start of life. Second house deals with wealth the person will accumulate or inherit. It is also linked with speech influence, how sweetly, rudely or how well the person speech or talks would be. More detailed information on each and every house can be fetched from pages in this website. We encourage you to learn astrology with examples of world famous celebrities.